This was a TOP SECRET mission…can’t even tell you the name of the location we drove to on Wednesday. The drive was about 4 1/2 hours, and like my predecessor, I never sleep in the Scion xB when it is in motion…I watch everything. And when our speed is about 40mph and below, My Dad opens the left rear passenger window and I can stare at people in cars next to me, smell the air, and monitor all passing traffic. 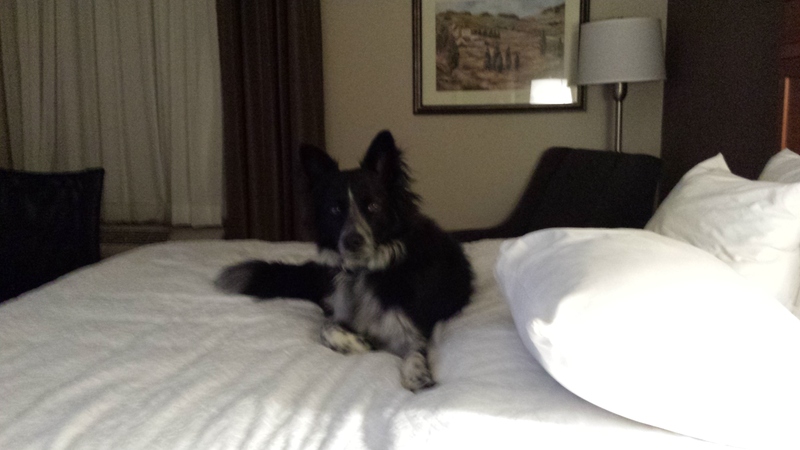 There were TWO queen-sized beds in our room…I was very quick to pick! Have you ever slept on FOUR pillows…yes, I am VERY privileged, just to answer a question from one of my loyal and faithful followers. The second night in (TOP SECRET), I was a bit more comfortable…I couldn’t decide if I should sleep in the bed (my OWN bed), sleep in the easy chair (pictured), or sleep snuggled up with My Dad. I did all three and then ended up in my own bed for the night. And, I had hamburgers from Culver’s and McDonald’s. 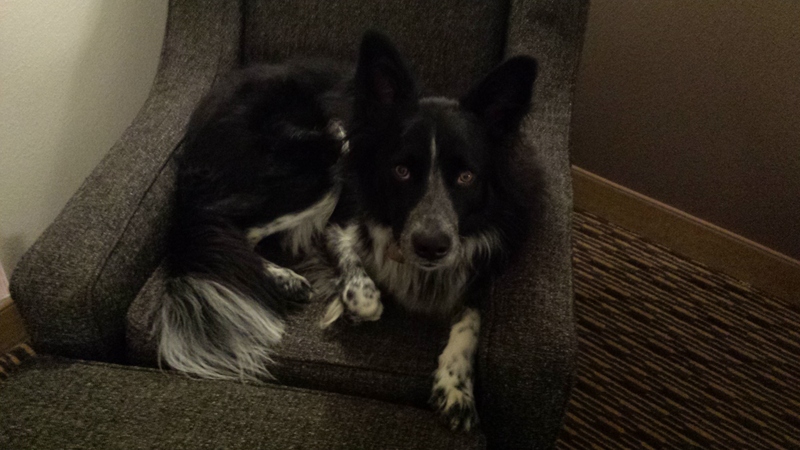 This entry was tagged border collie, border collie rescue, border collies, dog behavior, dog rescue, dogs and people, herding dogs, life with a dog. Bookmark the permalink. Well you dad sure found a nice hotel/motel that would allow you to accompany him on such a fun trip. Can’rt say that I blame you for bed hopping. After all comfort is what it’s all about. And you always want to remain in good graces with your dad by snuggling up to him when he’s asleep. 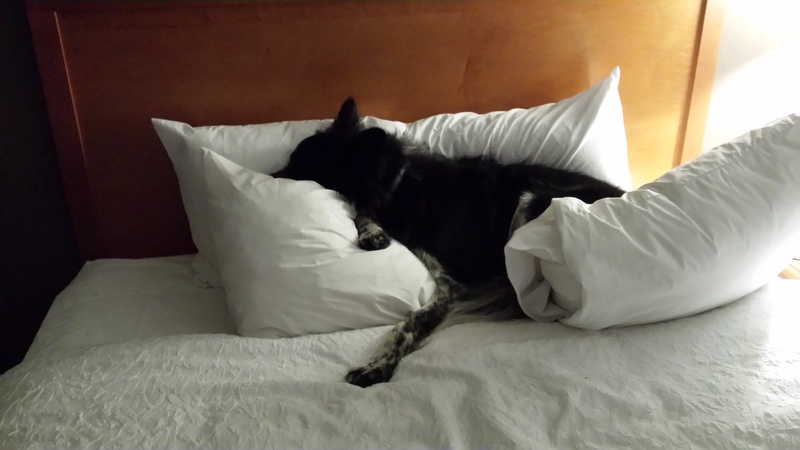 Clearly, you were born to sleep on four pillows, my friend. 🙂 From start to finish, your TOP SECRET MISSION day was perfect! Here’s to many more….soldier on! hi! Mom saw your Secret Mission entry tonight and she was impressed. She says to keep up the good work (note from Chris: I’m not sure if she is referring to your bed hopping or your writing….). My Dad says he loves your artwork…the dog ALWAYS looks happy! I’m glad you both like it! Let’s make the border collies rule the world haha! Dear Magic, Thank you for continuing to do Cody’s incredible work traveling around the world as a therapy dog. You bring a lot of people a lot of happiness…not just out there, but here too. And, you are very handsome. Also, I like to give my dogs hamburger treats from Mcdonalds sometimes too. They certainly do love it!